I have a 2008 M8 with a 162 in. track and I noticed it rides kind of low in the back compared to most other sleds. So I read the manual and it says there is a three position cam you can set and changes the angle of the spring based on the weight of the rider. So I go out, look at the rear suspension, and none of this stuff is under my sled! All I can see that would possibly lift the tail end is a Fox air shock. I checked it and it was at about 100 psi, and the book said max is 150 psi so I bumped it up but no real change. Still a low rider. There is a large threaded ring on the center coil spring / shock combo. but I was afraid to mess with that. It looks too far forward to just lift the back end and I was afraid I would mess up the handling. The only problem is I have done some small jumps and bottomed the track out on the inside of the tunnel. But it just looks like a low rider. Thanks in advance for the help. If you look towards the rear of the track their should be a torsion spring on both sides. The front arm is long and is bolted to the suspension. The back arm is short and rests on a triangle. This triangle is the cam that you heard about. To adjust it you need to take the spring pressure off of it and rotate it so that the arm of the spring rests on a different edge of the triangle. This will make quite a huge difference to the ride stiffness but can be a pain to adjust. If you have an OEM air ride I would love a pic of the suspension itself! 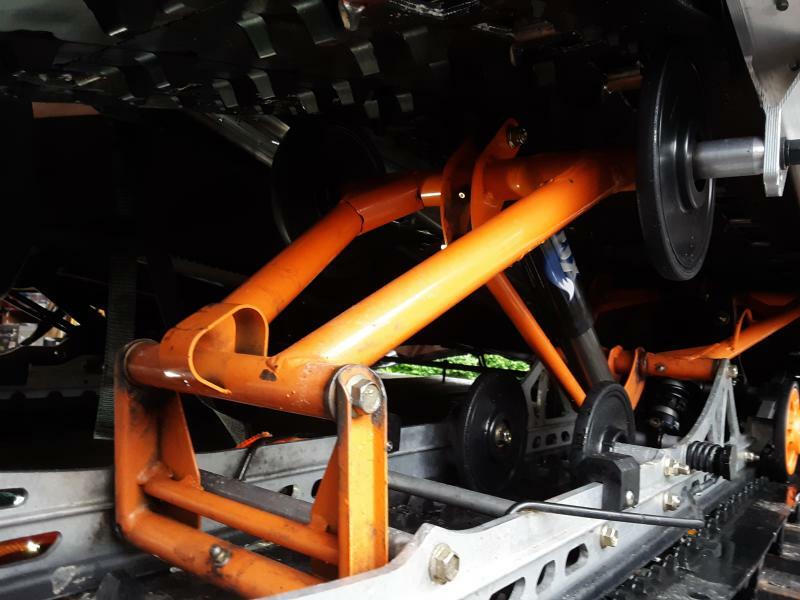 Here's some pics of my rear suspension. No torsion spring or triangle so I just don't get it. The only adjustment other than air pressure is the ring to tighten up the coil spring but wouldn't that effect the handling too? I've heard it's good to have less weight in the center of the sled and most of it at the rear of the track and the skis. Anyway thanks for the help. If you are still soft bump up the pressure more and give the front spring 2 rounds! The only affect is pushing up the back itself will push too much weight to the skis. So balance with a bit more front skid pressure. That looks low to me too. When you pick up the rear, does it lift easily for several inches until the suspension tops out? If you've got too little preload, you lose a lot of travel and will bottom out easily. 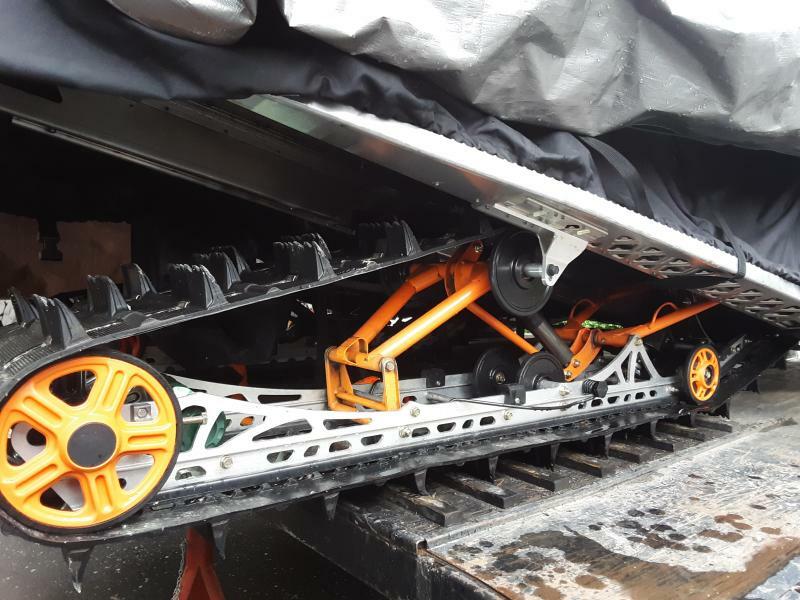 My sled has torsion springs like you mention with a rectangular block you can turn to increase/decrease tension, but some newer sleds use a spring-shock instead of torsion springs. 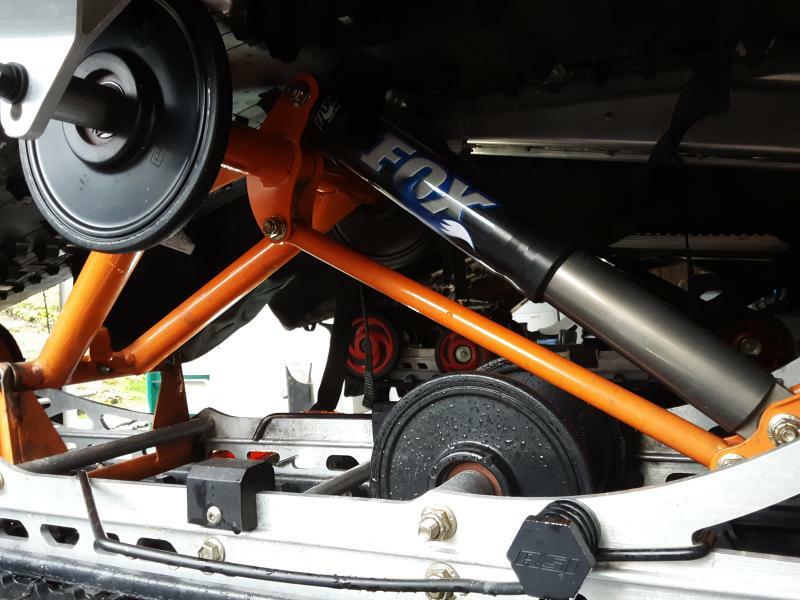 With a coil-over, you'd just turn the adjuster until you got it where you needed it, and an air setup should work similarly but with more air pressure. I'd suggest adding air until you reach the FSM recommended level, but might not be a good idea if you're already at the limit. On a mountain setup, the rear has a far more pronounced effect than the front (referring to the skid, not the skis), and on mine cranking up the front spring won't lift the rear a bit. 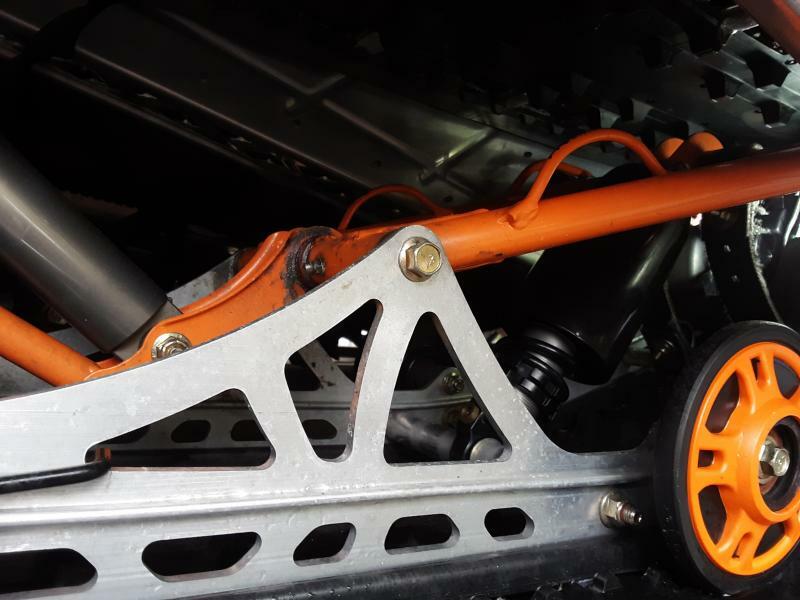 Yours looks like a coupled setup though, so maybe turning up the front spring lifts the rear too – on mine you can wind it as tight as it'll go and it won't lift the rear. Wont lift the rear but affects ski pressure. Well I tightened the ring on the coil over spring in the front of the skid, and topped up the air pressure on the back shock, and it has stiffened up the ride but did not raise the back up any. I didn't bottom out so I guess it's fixed and that's the way the manufacturer wanted it to be. It's just lower than a lot of the newer sleds I see. Unless anyone knows of any aftermarket lift kit or anything? The sled goes great so I guess I need to move on and start fixing things that are actually broken. 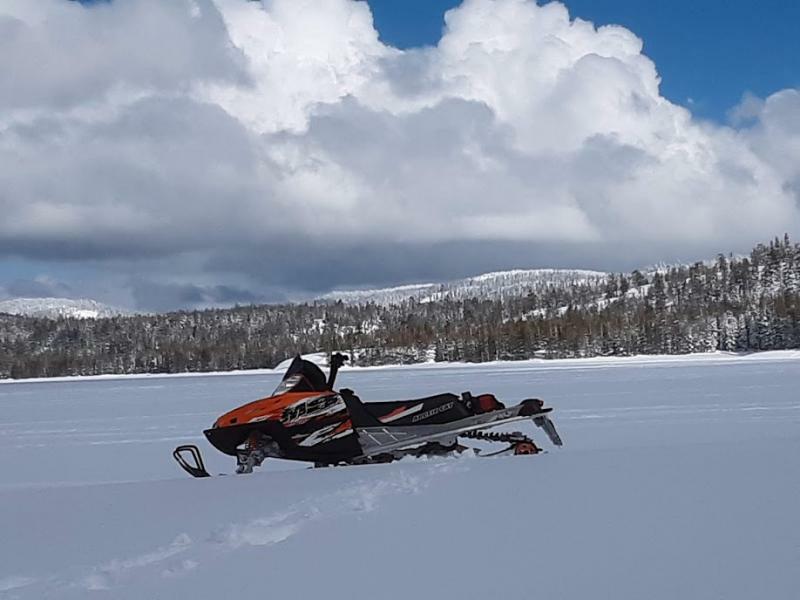 We rode last Sunday in the Tahoe National Forest near Truckee CA and it was pretty heavy slush so sadly that may have been it for this season. It's been a great one though. Hope you guys have colder weather for a while. Thanks again for the advice.